The finest rubies in the world come from Burma, particularly from the mining area known as the Mogok Stone Tract. This region has been famous for centuries for fine pigeon blood ruby with a distinctive fluorescence. A more recent deposit in Mong Hsu yielded large quantities of ruby, but these gems required heat treatment to achieve a true red color. Ruby production from Burma has declined significantly in recent years and most of the larger rubies entering the market are now from other sources, particularly Tanzania, Mozambique and Madagascar. 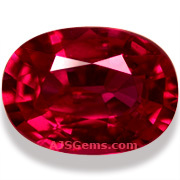 The finest Mozambique rubies can come close in color to high quality Burmese rubies, but they do not have the distinctive fluorescence of the Burmese. 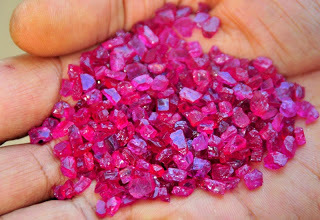 The reason is that Burmese rubies are very low in iron, while the Mozambique rubies have a higher iron content. A recent GIA study noted that the geological conditions of the Mozambique (and Tanzanian) rubies differ from both the Burmese and the Thai rubies. The Burmese rubies are found in marble while the Thai rubies are basalt-related. The African rubies tend to be found in amphiboles, and their iron content falls in between the iron-rich Thai rubies and the iron-poor Burmese gems. We should note that only a very small percentage of the Mozambican ruby production is clean material with a vivid red color. In fact most of the rough stone found has surface reaching fissures and must be heated with flux or filled with lead glass to be saleable. But fine ruby is so scarce that the relatively small quantity of high quality gems from Mozambique are already making a major impact on the gem market. While Mozambique rubies are still priced below Burma goods, prices on the African rubies have moved up rapidly as the market becomes familiar with these gems.